TORONTO – March 19, 2014 – On Thursday April 17th Salt + Light Television will broadcast the world television premiere of it’s new documentary The Francis Effect. From the moment Pope Francis appeared on the balcony of St. Peter’s Basilica, he won the hearts of the people. With characteristic humility, simplicity and proximity to the poor, Francis has initiated a fundamental reform of the Roman Curia, challenged a “globalization of indifference,” and become the most talked about person in the world. 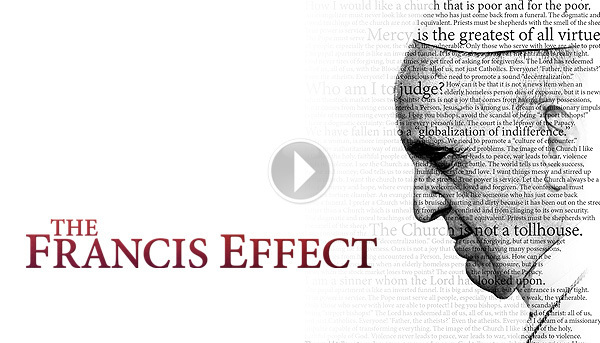 The Francis Effect takes a critical and in-depth look at the emerging themes of Pope Francis' pontificate and how an ancient institution is rapidly changing under his leadership and vision. Catch the world television premiere of The Francis Effect on Thursday April 17 at 9pm ET / 6pm PT, only on Salt + Light Television. Born on the wings of World Youth Day, Salt + Light harnesses the energy, zeal and idealism of youthful communicators to help identify, produce and share stories of hope and the teachings of the Church with the world. For more information visit saltandlighttv.org.